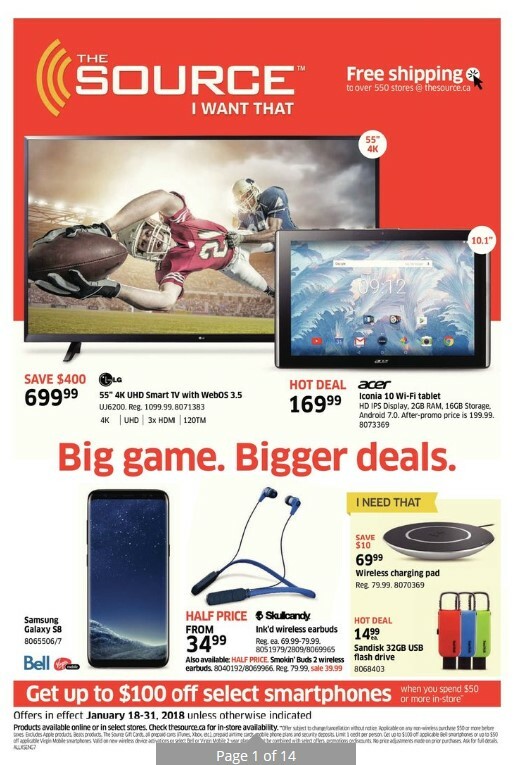 The Source Flyer Canada - january 18 - 31, 2018 - LG 55" 4K UHD Smart TV With WebOS 3.5 Model 8071383 $1099.99 Regular Price $699.99 Sale Price $400.00 Savings UJ6200. 4 K. UHD. 3x HDMi. 120TM.Iconia 10 Wi-Fi Tablet Model 8073369 $199.99 Regular Price $169.99 Sale Price 10.1". HD IPS display, 2 GB ram, 16 GB storage, android 7.0.Skullcandy Ink'd Wireless Earbuds Model 8051979 2809 8069965 $69.99-$79.99 Regular Price From $34.99 Sale Price 50% Savings Battery life Up to 8 hours. 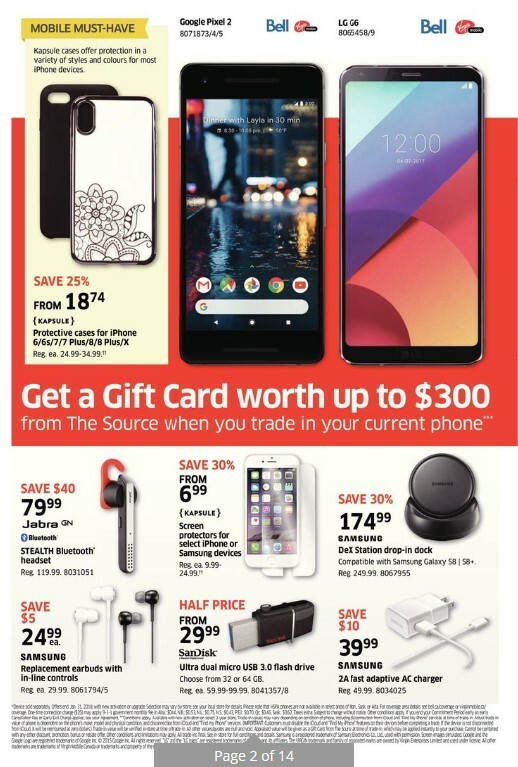 Wireless Charging Pad Model 8070369 $79.99 Regular The Source Flyer Price $69.99 Sale Price $10.00 Savings Power output 15W.Sandisk 32GB USB Flash Drive Model 8068403 $14.99 Sale Price Capacity 32GB.Kapsule Protective Cases For iPhone 6 6s 7 7 Plus 8 8 Plus X $24.99-$34.99 Regular Price From $18.74 Sale Price 25% Savings Kapsule cases offer protection in a variety of styles and colours for most iphone devices. Samsung Dex Station Drop-In Dock Model 8067955 $249.99 Regular Price $174.99 Sale Price 30% Savings Compatible with samsung galaxy S8 S8+. Sandisk Ultra Dual Micro USB 3.0 Flash Drive Model 8041357 8 $59.99-$99.99 Regular Price From $29.99 Sale Price 50% Savings Choose from 32 or 64 GB. Samsung 2A Fast Adaptive AC Charger Model 8034025 $49.99 Regular Price $39.99 Sale Price $10.00 Savings. 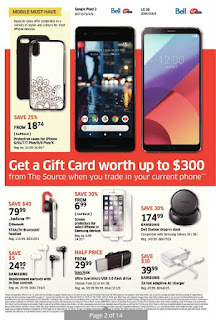 X-Doria Defense shield Cases For IPhone 7 7 Plus 8 8 The Source Weekly Flyer Plus X, or Samsung Galaxy A5 S7 S8 $39.99-$59.99 Regular Price From $19.99 Sale Price $20.00 SavingsKapsule Select Cases For the Samsung Galaxy A5 (2017) $19.99-$29.99 Regular Price $From $14.99 Sale Price 25% Savings. Book Cover For The Samsung Tab A 7.0" Model 8047276 7 $31.49 Sale Price The sleek and sophisticated Samsung Tablet Folio Case keeps you looking professional and your devices protected from dings, scratches and scuffs!